Cavalier Breeders in Florida » Our Blog » Coming Soon! If you are interested in applying to purchase one of our quality Cavalier King Charles Spaniel puppies for sale in Florida your family, please email us Contact Us By Email. As reputable Cavalier King Charles Spaniel dog breeders in Florida, we will be happy to answer any questions you may have about our dogs and puppies. We look forward to hearing from you! 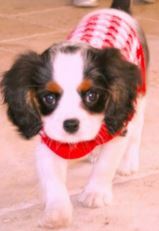 Thank you for your interest in our Cavalier King Charles Spaniel puppies for sale in Florida. We ship within the USA. St. Petersburg, Tampa, Fort Myers, Orlando, Jacksonville, Miami, Boca Grande, Boca Raton, Sarasota/Bradenton. Copyright © 2019 Robbie's Rosewood Cavaliers. All Rights Reserved. Designed by Smart Pet Websites.